Nordic Literature – not all Noir! 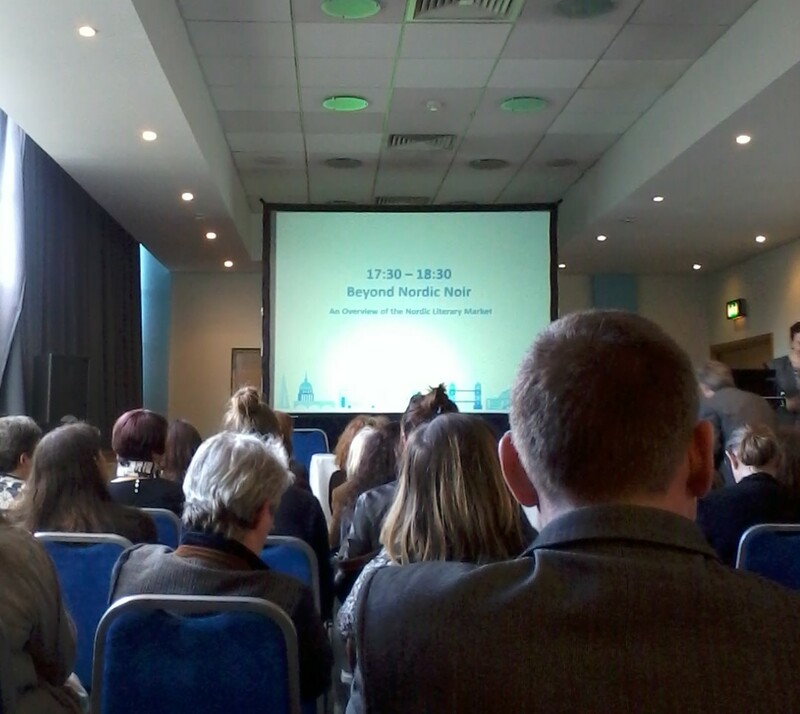 This post is related to the London Book Fair 2014 (see my earlier post on my visit) when I attended a seminar called Beyond Nordic Noir: An Overview of the Nordic Literary Market, which was all about literature coming out of the Nordic countries and the fact that it isn’t just crime novels! Writers need to be able to develop and grow. Dedicated local readers are needed before a book is translated. There’s a need for supportive government policies for books. Small countries (like Iceland with its tiny population) need to decide on and maintain support for books. Publishers can keep publishing translated fiction because they have less risk due to government funding for it. Only 5% of 700 titles translated to other countries are actually crime! No VAT on books in Norway keeps prices down. Publishers can have a fixed price on books so booksellers can’t choose the price. Physical bookshops are doing well due to the lack of price competition, so they work better than UK bookshops. Publishers have more profit to subsidize translations. Everyone in the population of Norway reads at least 1 book per year. 40% of the population reads more than 10 books per year. 5000 new titles are published each year – 60-65% are by Norwegians. There’s 600 bookshops in Norway! There’s 10 internet bookstores, but no big one. Who will be the publishers? Globalisation – every 4th book is in English. Centralisation – fewer players who are bigger (Amazon hasn’t launched in Norway…yet). Then there was some discussion of certain authors and books which have come out of Norway, Sweden, Finland, Denmark, and Iceland, and each country’s literary councils which help promote their books. There are plenty of Nordic support schemes, with translation grants, sample translation grants, travel grants for writers, authors, publishers, etc, production grants, and promotion grants. In addition, the Nordic countries tend to join together to do joint promotions because they are successful, but it must be stressed that just because they are grouped together they are NOT all the same! I was impressed by the fact that the book industry in Scandinavia seems so much healthier than the UK with their price fixing (which we ditched), the lack of VAT on books, and the amount of funding available for translated fiction in the Nordic countries. There was a section by the speaker Boyd Tonkin who named his favourite 5 Nordic authors: Linn Ullman (Norway), Sofi Oksanen (Finland), Carsten Jensen (Denmark), and Sjon (Iceland, but I’m afraid I have forgotten who he picked from Sweden! Oops! I would love to read more Scandinavian books, so far I have only read a few Nordic crime novels and one Finnish novel, and that’s pretty pathetic! Crime isn’t even one of my usual genres! I’m definitely going to look into some new Nordic books! I love languages! This is the second part of my posts about my relationship with languages. As i mentioned in my previous post, i studied English Literature at university, so i know a lot about my native language already. I did a module on TESOL (teaching English to Speakers of Other Languages) and the first thing the tutor did was speak to us in one of her foreign languages, in this case it was Indonesian. I can’t remember anything she said, mainly because i had a mad panic at being addressed in a completely unfamiliar language! A good example of how people feel when they first learn a foreign language! I chose to study Arabic as an extra-curricular activity whilst at university, and i studied it for a semester because i wanted to learn something new. Arabic is a totally different language: not only is it from a different language family, it is read from right-to-left (instead of left-to-right like English, German and so on), letters of the alphabet change when you write them down in certain ways, and it is a cursive language. I got totally confused at times while studying Arabic! It is one of the hardest languages to learn because it has a different alphabet, which i spent hours trying to learn! I made reasonable progress with Arabic, although when the final exam came i completely stuffed it up and subsequently failed the class! Oops! To be fair, it was only a recreational class and not part of my degree, so it didn’t take priority when i had important essay deadlines and a dissertation due around the time of the final exam! My Arabic skills consist of being able to say a few greetings and replies, and the odd word, but i can’t read Arabic and i have forgotten the letters of the alphabet, except for “al” which basically means “the”. I don’t have much to show for that class! I do still have the Arabic learning CD set though, so i could attempt to learn it again! Outside Academica/ In the real world! I have had the opportunity to visit other countries and learn their languages, mainly through holidays. Mainly i know the Scandinavian languages, having visited a few of those countries. As my family has friends in Sweden and we’ve been on family holidays over there a few times, i learned words and phrases to make our trips more interesting. I know greetings and simple touristy phrases, and i know lots of random words! My food vocabulary is my strongest skill in Swedish, as i love Swedish food! I can pick out words from sentences and make a guess at what it means! I also had the opportunity at university to study abroad and Sweden was my country of choice, but in the end i decided i would rather stay in England for the rest of my degree because i loved my university city, York, too much! Actually, i see now that i was very stupid to pass up such an opportunity! Oops! Finnish is another difficult language which is from a different language family to the other Scandic languages. It is fascinating though! I went on a family holiday to Finland as a teenager and i learned a few simple phrases and words in Finnish. I can pick out the odd word, but sentences are a bit too difficult to understand! It is one of the more difficult languages to learn, especially with the sentence structure and so on. I did actually do an essay on the Finnish language at university, several years after this holiday, for which i learned about the history of Finnish and how Swedish used to be the main language spoken in Finland until Finnish was introduced as the main language. One day, it would be nice to learn a bit more Finnish because it is a really fascinating language! I went to Denmark a few times on holiday, so i learned a few Danish words while i was there. Mainly i know food vocabulary! Currently i am taking 1-1 tutorial sessions to improve my German language skills, in the hope that i will someday be able to either live and work in Germany or at least communicate in German on a regular basis while working here in the UK. It is my favourite language so i decided to give it a shot, and i’m finding that i can actually remember a lot of my school German when prompted! The only problem is getting my head around all the grammar rules again! In the future, i would like to maybe give Arabic another shot or start learning Finnish, as both are quite difficult to learn. I would love to learn Swedish properly, and i would like to improve my French to i can communicate more fluently in it! My main aim is to become fluent in another language before i’m 30, so i’ve got 5 more years to get cracking! 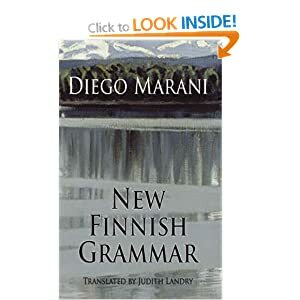 I have just finished reading “New Finnish Grammar” by Diego Marani (translated from the Ialtian by Judith Landry). I read it because it ended up in the shortlist for the Independent Foreign fiction Prize 2012 and it sounded intriguing. The book follows this man “Sampo” as he tries to recover his memory and his identity, and immerses himself in learning the Finnish language and trying to re-build himself with a Finnish identity. He notes down everything he learns and has help from a pastor who teaches him about Finnish history and folklore while helping “Sampo” learn the difficult Finnish language. Most of the book is written from the point of view of “Sampo” himself, but there are notes and background information along the way added by the Finnish doctor who found him, treated him, and told him to learn Finnish. These notes are useful in filling in some of the gaps, but we also learn about the doctor and his own personal history and feelings towards his homeland. I’m not so sure i like the doctor very much because he seems so determined that “Sampo” is Finnish and encourages him to find himself again. But, even though he was acting in what he believed is the best way, i feel a bit sorry for the doctor because of his mistake. The pastor is a more interesting character: He talks a lot about Finnish folklore and God and so on, and he seems to lose the plot a bit towards the end where things turn a bit strange. He seems to think a lot about things and has a lot of opinions, and i thought this might push “Sampo” in the wrong direction, as he may not be the best influence on him. I’m still not sure though. The focus on the Finnish language (the book isn’t, as the title suggests, about Finnish grammar in a technical manner) is quite interesting, especially with the book’s original language being Italian. As i’m reading it in English, i found it hard to believe that it was from Italian, because there is just so much Finnish in there. Indeed, as well as the story, we learn a lot about the language itself from this book. I was fascinated by the idea of a man with no memory of a mothertongue learning a whole new language from scratch, not even able to match a word in Finnish with one in an existing language. Especially Finnish, which is one of the most difficult languages to learn and which is rarely spoken outside Finland. Language is really important to identity because it is the only way you can communicate with others, or even inside your own head. To have no language at all can cut you off completely from the world around you, and i can’t imagine the feelings of desperation that “Sampo” was feeling during this book. He makes a great effort to create a new identity for himself by learning Finnish and exploring Helsinki and joining in with others, but he is still the outsider with nothing of his own to share. This book is difficult to follow, maybe a bit too long as well, and having two narrators can get a little confusing at times, but it is a fascinating read. If you can persevere with it, you will appreciate how difficult it must have been to not only write, but also to translate. The ending is a bit predictable, but at the same time it is rather vague. I give this book 6/10 because it is an intriguing subject to read about and “Sampo’s” tale is desperately sad and kind of beautiful in its own way. Difficult but worth reading if you can get through the considerable amount of brain-draining waffle in it! I wouldn’t read it again though, too much effort! Note: I read this on my Kindle, and the ebook read very well.